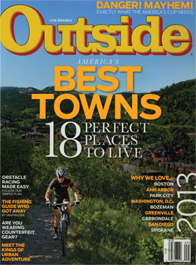 In the September issue of OUTSIDE Magazine, Park City was selected as the 2013 Best Town in America to live. The intro page headline to the article simply states "Welcome to the Good Life" and goes on to say "The goal was simple; Find America's best place to be healthy. We wanted a town with ample trailheads, nearby adventure, great farmers markets, and, hopefully, a competitive gear-shop scene. To pick it we turned to you. In our third-annual crowdsourced contest, readers cast more than 21,000 votes online and raved about these 18 towns.